Glacier National Park is known as the "Crown of the Continent." A special area that spans the U.S.-Canada border, Glacier National Park and Waterton Lakes National Park together encompass the Waterton-Glacier International Peace Park, commemorating the peace and goodwill that our two nations share. This park is also a UNESCO World Heritage Site which designates it as a place of special cultural or physical significance to the world. A little history of the area: In the early 20th century James J. Hill, president of the Great Northern Railway, set down track and built lodges in the area to entice well-heeled easterners to visit. In fact, this savvy entrepreneur originated the phrase, "See America First" as a slogan to encourage wealthy Americans to travel by train to the west and to stay in the mountain lodges. After WWII the hotels and chalets in the park fell into disrepair. Luckily, the hotels were saved from demolition, renovated and preserved for future generations. These special historic lodges, dotted throughout the park, are no more than 50-60 miles apart. They take us back in time and provide us with the perfect distances to cycle from one to the next, making this ideal for bike touring! 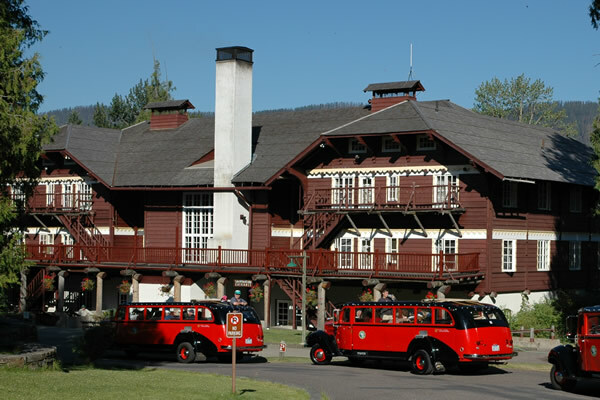 Our tour begins in East Glacier, Montana where we will enjoy our first night's stay at the Glacier Park Lodge. This 100-year old lodge is famous for its giant Douglas fir trees and provides us a lovely start to our tour. 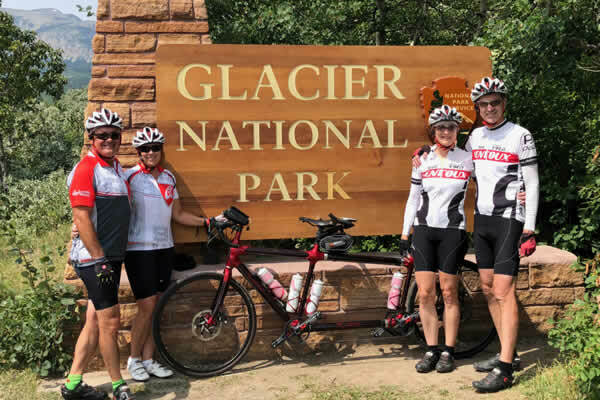 Our first day's ride of 60 miles takes us into the heart of the park as we travel to the Many Glacier Hotel. 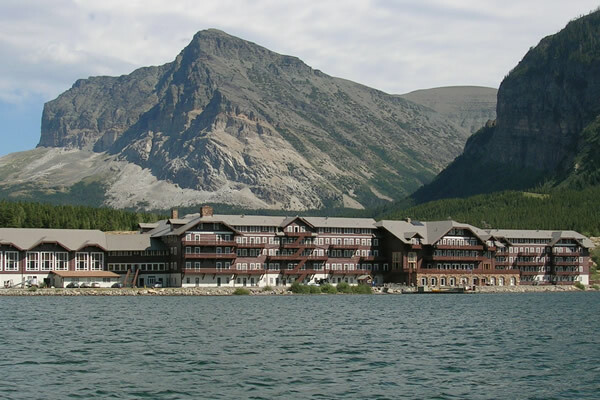 Called the "Switzerland of North America," Many Glacier, the largest of the lodges, sits on the shores of Swiftcurrent Lake in a truly idyllic setting. Much of the hotel was renovated in 2016. Continuing north for 54 miles, we leave the U.S. and cross into Canada, making our way to the village of Waterton. 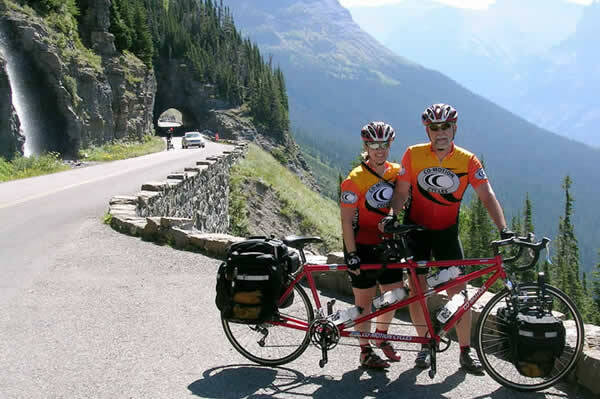 We have 2 nights in Waterton to enjoy a day off the bike (if you wish) in our alpine environs. You might like to take a boat trip on the lake for a short hike, spend the day exploring the town, or take a short ride to Cameron Lake. Leaving Canada, we retrace our route 50 miles to the south to St. Mary, located at the eastern base of Going to the Sun Road. 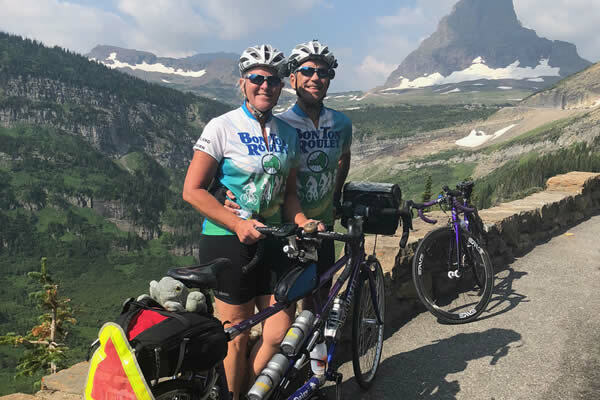 We'll have a night in St. Mary at the charming Glacier Trailhead Cabins before the highlight of our tour, the ride over the very special Going to the Sun Road. Going to the Sun Road crosses the continental divide at Logan Pass. 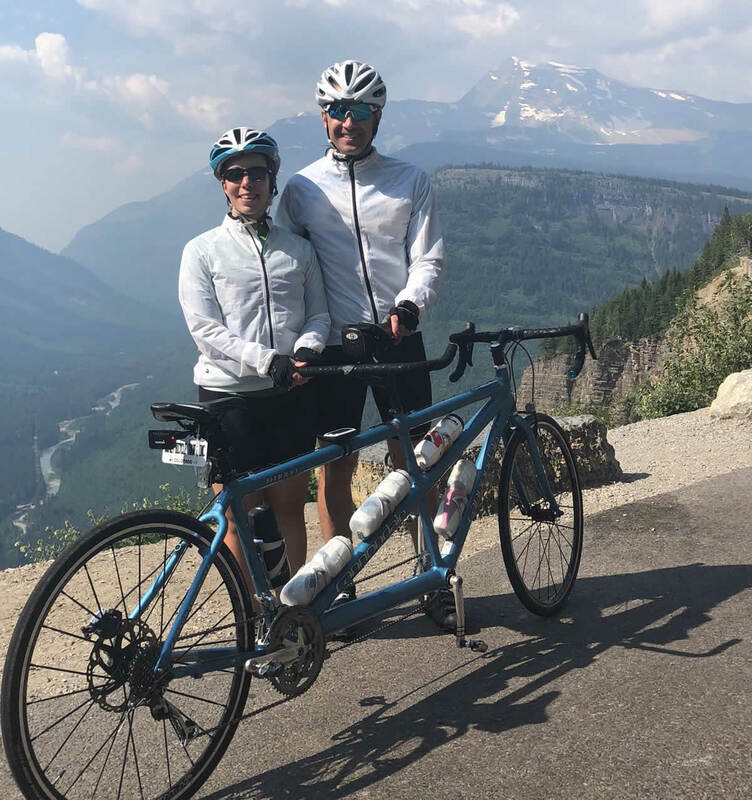 This spectacular ride is less than 40 miles long, less than 2,500 feet of climbing and it is breathtakingly beautiful. 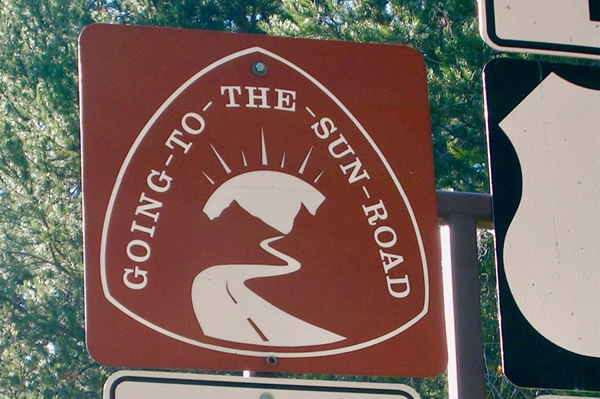 You will have ridden more distance and elevation than this on previous days on this tour so you will be ready to climb Going to the Sun. After cresting the summit we'll enjoy a very long downhill to Lake MacDonald Lodge, which feels like an old style hunting lodge. Our tour ends with our last night's stay at Lake MacDonald, followed by a shuttle service the next morning back to West Glacier, where we will say our goodbyes. PLEASE NOTE: Cell service and WiFi extremely limited on this tour! If you want to really "unplug," this tour is for you!